Every time I think we've heard the last of Ireland's The Answer, they reappear with a new album. Actually, they have been rather consistent, releasing an album every two years and then touring in support. Maybe it's all the music that passes across my desk in between that makes me think it's been longer. So here's Raise A Little Hell, their fifth studio album. 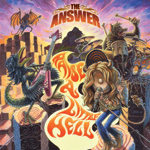 Much like their output, The Answer's sound has remained consistent and constant. It's the foundation of fundamental melodic heavy hard rock, tricked out with some tones of blues and psychedelic rock. A throw back of sorts, the band could be rocking the late Seventies. Though from Ireland, they never really try to put some Gaelic folk spin on their tunes, or try to sound like Thin Lizzy. No doubt some of this consistency comes from the simple fact that it's the same four dudes doing the music for better than 10 years, with Cormac Neason's whiskey-soaked vocals at the fore. 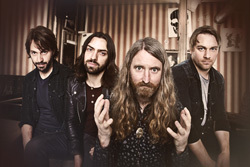 Mostly, at least at the start, the album moves along smoothly with The Answer dealing out lots of rock and groove with thick riffs, tight melodies, and catchy hooks and refrains. Early on, the notable song is Aristocrat thanks to it's groove and echoing guitar. The first ballad Cigarettes & Regret offers a steady movement, some slight psychedelic guitar lines, and some seemingly serious lyrics. But then the first bump in the road arrives as Last Days of Summer, a true heavy rock number, merely lumbers along. The acoustic ballad Strange Kinda' Nothing is a real rebound, a light melody with a great vocal arrangement. I Am What I Am and Whiplash follow, returning more of that bounce in groove found in the early moments of the album. But then, with Gone Too Long, another lumbering introspective ballad, arrives and I start to lose interest again. Everything after this merely sounds heavy and twisted in the riffs. Oddly, with a title like Raise A Little Hell, you would think the last number would be a balls to the wall, brawl in your Irish pub, rocker. But no. Again, it's more thick and lumbering like an Irish golem. By my calculations, I liked better than half of the album, seven out of twelve songs. That's not so bad. I suspect diehard fans will dig them all, and that's a good thing too. 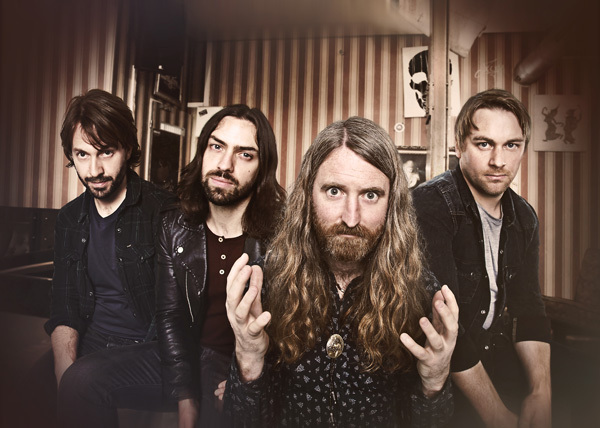 With Raise A Little Hell, The Answer maintains their focus, delivering fundamental melodic heavy hard rock, tricked out with some tones of blues and psychedelic rock.